Bento for Kidlet: Stitch is troubled, he needs desserts! Kidlet has always loved Lilo and Stitch! One of his favorite lines from the movie is "Stitch is troubled, he needs desserts!" So it was perfect that I happened to make funnel cakes today. Check out our funnel cake adventure here . So cute, I love Stitch too! Jbox.com has an adorable stitch egg mold! Haha, so cute!! Excellent drawing, as always, Jenn! That bento is so cute! 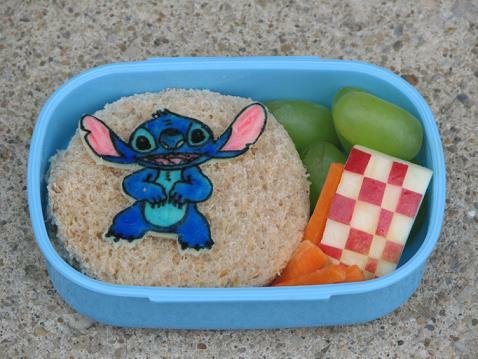 Love how you created Stitch on the cheese. This is just too adorable. And, I LOVED your Buckeye cupcakes!! Go Bucks! !